Details : 29" Ev. Tet. E Re. Bl 5.25"
Details : Ht 24" TET. Ev. E-M. Re. Bl. 5"
A clear lilac lavender with an iridescent cream throat surrounded by a purple triangular eyezone. Excellent growth Distinctive colouration and eye pattern. Fragrant. Details : Ht 22" DIP. SEv. L Re. Bl 4"
Light violet with a big purple eye and green throat. Many blooms. Pretty. Details : Ht 20" DIP Ev. E Re. Bl 5.5"
Details : 26" SEv. Tet. E-M. Re. Bloom 5" - 6"
Large silvery lilac blooms with a large green throat. Prolific. Limited stock - 1 per customer. Details : 30" SEv. Tet. M. Re. Bloom 6"
Plum violet with a large light eye pattern of ivory overlaid lavender. Blooms are broad, flat and rounded. Limited stock - 1 per customer. Details : 28" Dip. Ev. E. Bl. 5"
A medium violet flower edged in lavender with a deeper halo and green throat. Limited stock. Details : Ht 30" DIP. Dorm. E-E Bl 6.5"
Foliage is smallish and thin like that of a miniature. Unique colouring of violet with a tone of grey and a purple eye. Lime green throat. Gorgeous. Another image clumped in "Eyed and Fancy". Details : 26" Ev. Tet. E - M Re. Bl 6"
Amethyst violet bloom with a yellow appliqued throat. 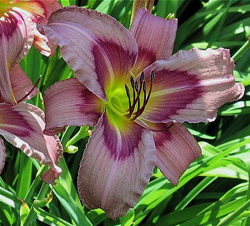 A distinctive daylily. Limited sock - 1 per customer. Witches Britches - Exclusive to R.B.D & Irises. Details : Ht 30' Ev. TET. M Re. Bl 5.75"
(Lucid Moment x Leaving Me Breathless). Purple blooms with a cream watermark center surrounding a yellow throat. Gold braided edging. Limited stock - 1 per customer.